Georgii Bogdanovich Yakoulian (Yakoulov) was born in Tiflis on January 2nd 1884 and died in Erevan, Armenia, on December 28th 1928. A painter, graphic artist and set designer, he lived in Moscow from 1893 becoming a leading member of the early Soviet avant garde. In 1900-02 he studied at the Moscow Institute of Painting, Sculpture and Architecture where his teacher was the artist and set designer, Konstantin Yuon. He was dismissed from the College in 1903 for rebellious behavior and was immediately called up for military service on the Russo-Japanese front. During his time in the East, particularly in Manchuria, he began to develop his theory of light. In later years this may have been an influence on Robert and Sonia Delaunay whose theory of Simultanism has much in common with Yakoulov's ideas. "One of the most bohemian and histrionic characters of early Soviet culture". John Bowlt (1982). 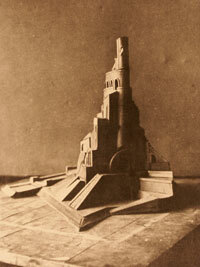 Yakoulov's prize winning model of the Monument to the Twenty-Six Commissars of Bakou presented at the International Exhibition in Paris 1925. 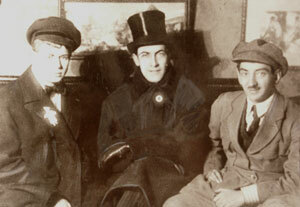 Yakoulov (right) with his close friends the writers Sergei Esenin and Anatolii Mariengof. Photographs are from the private collection of Mary Sarkassian entrusted to Lesley-Anne Sayers in 2001. In 1917 Yakoulov designed the interior of the Cafe Pittoresque in Moscow assisted by Alexander Rodchenko and Vladimir Tatlin. This is thought to have been the first time three dimensional non-utilitarian constructions were used to create a total environment. Movement, light and theatrical dynamism were at the heart of his approach to both painting and stage design. He is particularly renowned for his designs for Alexander Tairov's Kamerny Theatre productions in Moscow, but he also collaborated with Meyerhold and other directors. 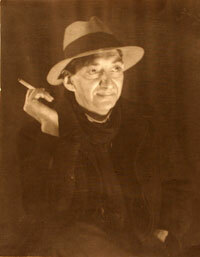 Yakoulov was an active force in the transformation of Russian theatre post 1917. He embraced the notion of theatre as an active educational force for change that sought to reach and involve the Soviet peoples by drawing on forms from popular entertainment, such as circus, vaudeville and cabaret. But above all Yakoulov was committed to a dynamic conception of theatre as interactive, anti-naturalistic and performance based. Unlike many of his contemporaries, Yakoulov never abandoned easel painting, and remained an eclectic artist with a love of both bohemian and revolutionary ideals. His work draws on several artistic movements, principally Futurism, Cubism and Constructivism. His paintings were exhibited internationally, alongside leading artists of the day, but he was best known for his theatre designs which were highly influential in both Moscow and Paris. Yakoulov worked also for the theatre in Yerevan, in his beloved Armenia, where he died of pneumonia aged 44. On his death most of his paintings were left in Paris - some in the care of Larionov. It was not until the 1970s, through the research and efforts of museum curator Mary Sarkassian, that his work was to return to the former Soviet Union. The major collection of his paintings is held by the National Gallery of Yerevan in Armenia.